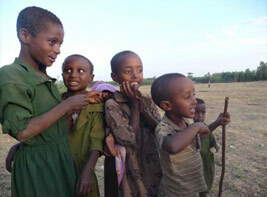 In Bahir Dar a huge majority of the people are by our standards very, very poor. However Sister Terfartu’s life is dedicated to those whom she calls the ‘poor’. These are people, mainly women, who due to AIDS and/or Malaria find themselves desperately trying to raise a family and survive. These are country people that thanks to you receive the most help. It is not all handouts either-where possible we will try to help them generate income but some times a handout is just the boost they need. Around 20 families come to see Sister every day and receive porridge, a mixture of milk, eggs and maize all boiled up in a large pot. This is the only meal of the day for some. Several of the children are very malnourished and this is just what they need. Whilst eating this culinary delight the adults are taught basic reading, numbers and general social awareness, including birth control and AIDS prevention. From this year’s funds we purchased 36 chickens allowing 18 families two chickens each, from which they should receive at least one egg per day to either eat or sell. Apparently the local roosters roaming free will introduce themselves to the new ‘birds’ in town and the patter of tiny claws will allow the selling of future chickens, generating income and the step towards being self sufficient.